This everyday essential, emerald cut diamond platinum ring, is a must have unisex item, created by Merkaba Jewelry. It may be worn as an engagement , cocktail or promise ring. We cater to the world's most avid gem and jewelry collectors globally. This romantic, unisex emerald cut diamond band, is brand new and it represents strength and purity. 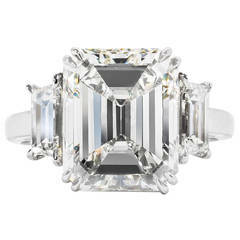 Specifications: Diamond - 1.16 carats, E color, IF clarity, Emerald Cut: GIA report number 1192665636 attached Platinum Size 6. Resizing is complementary upon request. Crafted by extremely skilled hands in the USA. ***This ring can be custom ordered with any center stone upon request. ***Returns are accepted within 7 days of delivery and will gladly be paid by us. Rings resized upon request, may also be returned.